1Institute for Behavioral Genetics, University of Colorado, Boulder, CO 80309, USA. 2Geriatrics Research Education and Clinical Center, Veterans Affairs Puget Sound Health Care System, Seattle, WA 98108, USA. 3Division of Gerontology and Geriatric Medicine, Department of Medicine, University of Washington, Seattle, WA 98104, USA. Wild-type C. elegans raised at cooler temperatures (16°C) can survive a sudden shift to a cold temperature (4°C). However, animals raised at warmer temperatures (20-25°C) die following a similar sudden cold stress. A single pair of neurons, ASJL and ASJR, are required for sensing warm temperature. Active ASJ neurons initiate a signaling cascade that results in lipid changes in the gut and decreased cold tolerance. In the absence of signaling from these neurons, worms maintain a cold-resistant lipid profile. Mutants that affect neuronal signaling broadly or ASJ signaling specifically are resistant to cold temperatures (Ohta et al., 2014). Testing C. elegans ability to survive a sudden drop in temperature is a rapid and robust method to detect changes in signaling from the ASJ nerve pair, and may provide a surrogate screen for broader neuronal dysfunction. Many C. elegans models of neurodegenerative disease have been developed with a range of phenotypes, from mild to severe neuronal dysfunction and degeneration. To determine whether these transgenic models of neurodegenerative disease display defects in sensory signaling, we assayed their level of cold-tolerance. We found that two different models of amyotrophic lateral sclerosis (ALS) are resistant to cold. TDP-43 M337V (bkIs423[Psnb-1::TDP-43(M337V); Pmyo-2::dsRED]) has a severe phenotype including progressive age-related neurodegeneration. TDP-43 WT (bkIs410[Psnb-1::TDP-43(WT); Pmyo-2::dsRED]) has a mild phenotype and no neurodegeneration (Liachko et al., 2010). Interestingly, both strains exhibited robust cold-tolerance (Figure 1). 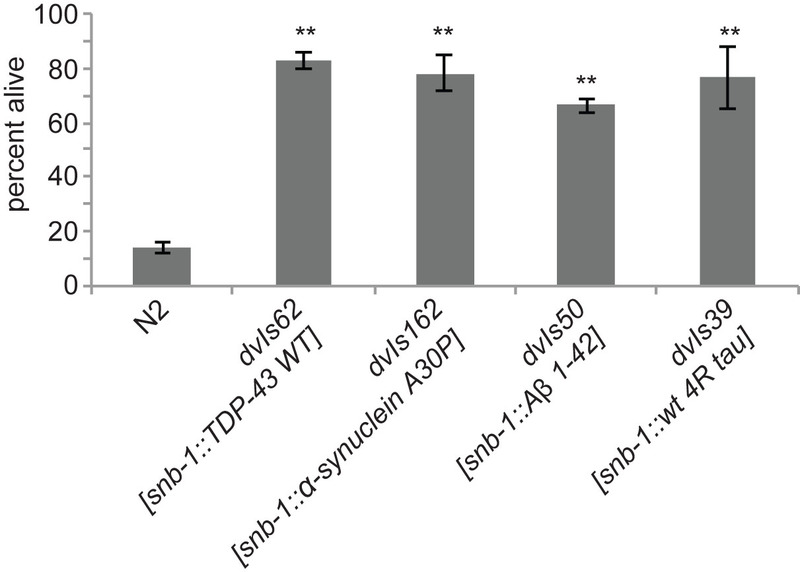 We extended this observation to a third TDP-43 model (dvIs62[Psnb-1::TDP-43 wt]) (Ash et al., 2010), as well as transgenic strains with neuronal expression of α-synuclein, Aβ, and tau (Figure 2) (Dosanjh et al., 2010). 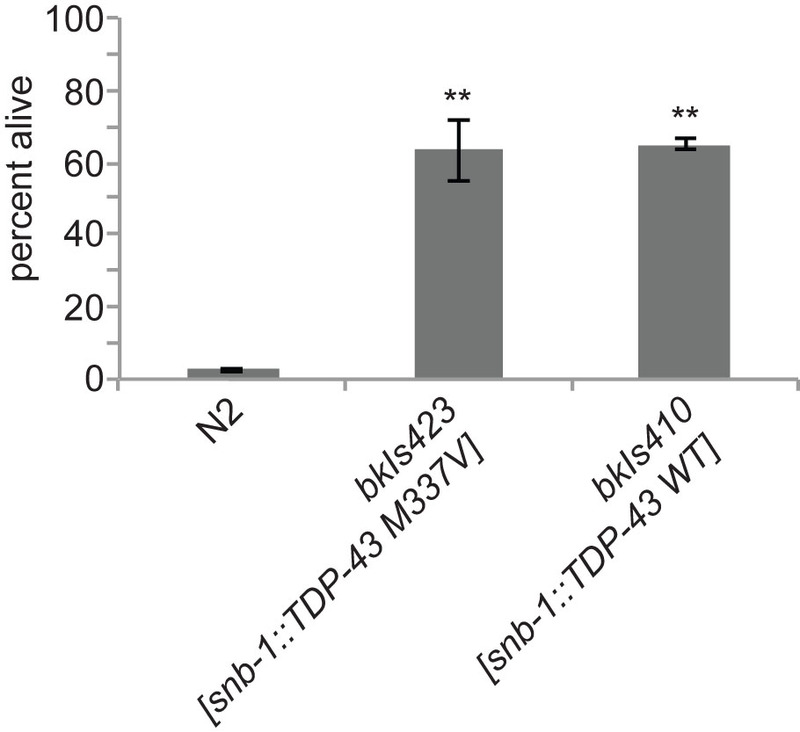 While neuronal expression of these toxic transgenic proteins also resulted in cold tolerance, muscle-specific expression of Abeta or TDP-43 did not (Figure 3). Cold sensitivity is able to detect neuronal dysfunction in strains with mild phenotypes, and is specific to changes in neuronal function. Cold sensitivity may be broadly applicable for rapidly characterizing neuronal function in specific genetic or transgenic backgrounds. In addition, this method may also be useful for larger scale forward and reverse genetic screening. For example, mutagenesis followed by multiple rounds of selection for cold tolerance might be expected to yield a high percentage of mutants with neurological defects. The setup and equipment needed to perform these assays are minimal, and any laboratory already utilizing C. elegans has the needed resources. To test your own strains for cold-tolerance, raise a stage-synchronized population of worms at 20-25°C to day 1 adult on standard NGM plates seeded with OP-50 bacteria. Spread C. elegans plates in a single layer on a tray to minimize temperature differentials. Do not expose worms to cooler temperatures (16-18°C) prior to the shift to cold. Transfer the worm plates to a 4°C refrigerator for 24-28 hours. We used an upright refrigerator that maintained an internal temperature range of 1-11°C. After their cold exposure, return the plates to 20-25°C and allow the worms to recover for 2-4 hours before scoring survival. Figure 1: Worms expressing wild-type (WT) or mutant (M337V) human TDP-43 in neurons are cold resistant. N=941(N2), 936(bkIs423), 432(bkIs410). Figure 2: Worms expressing human WT TDP-43, A30P mutant α-synuclein, Aβ, or 4-repeat (4R) tau in neurons are cold resistant. N=346(N2), 428(dvIs62), 268(dvIs162), 65(dvIs50), 146(dvIs39). Figure 3: Worms expressing human Aβ in muscle are not cold resistant. N=346(N2), 34(dvIs104), 61(dvIs2). Ash, P.E., Zhang, Y.J., Roberts, C.M., Saldi, T., Hutter, H., Buratti, E., Petrucelli, L. & Link, C.D. (2010). 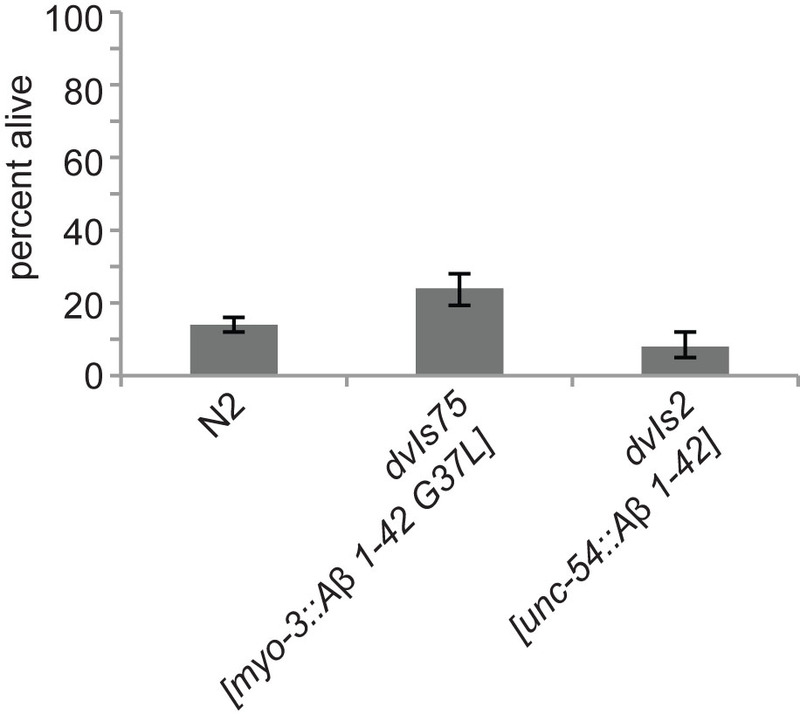 Neurotoxic effects of TDP-43 overexpression in C. elegans. Hum Mol Genet, 19(16):3206-3218. Dosanjh, L.E., Brown, M.K., Rao, G., Link, C.D. & Luo, Y. (2010). Behavioral phenotyping of a transgenic Caenorhabditis elegans expressing neuronal amyloid-beta. J Alzheimers Dis, 19(2):681-690. Liachko, N.F., Guthrie, C.R. & Kraemer, B.C. (2010). Phosphorylation Promotes Neurotoxicity in a Caenorhabditis elegans Model of TDP-43 Proteinopathy. J Neurosci, 30(48):16208-16219. Ohta, A., Ujisawa, T., Sonoda, S. & Kuhara, A. (2014). Light and pheromone-sensing neurons regulates cold habituation through insulin signalling in Caenorhabditis elegans. Nat Commun, 5:4412.